And yes – a 6-speed manual is still available while a 7-speed dual-clutch automatic is optional. Its brakes are shared with VW’s other performance cars as is the limited slip differential that helps to improve traction and further performance by reducing understeer. A fully independent, lowered sport suspension is made even more sophisticated on the special 35th Anniversary model by adding an adaptive damping system which includes a Comfort setting to the 4 standard drive modes: Normal, Sport, Eco and Custom. In addition to a more dynamic throttle and shift response and tighter steering, Sport mode includes a more spirited exhaust note. The black interior can be specified with either cloth or leather depending on trim while available features like the Digital Cockpit display, 400-watt Beats Audio system and 10-color customizable ambient lighting add pizzazz. 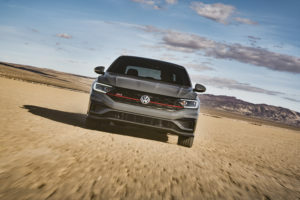 The 2019 Volkswagen Jetta GLI is available in 2 regular trim levels and a 35th Anniversary Edition. Pricing has yet to be announced.